Portugal. The Man would rather not explain the origins of their name yet again. To get them going, ask them about what they're doing when they're not topping the charts or headlining festivals: watching Trail Blazers games and refining their shoe collections. The Alaska-born, Portland-based band isn't interested in playing into rock-star cliches. Instead, they're repping their city in both Nike and Adidas ads and searching for WiFi to set their fantasy basketball lineups. Kicks custom and otherwise are an integral part of the guys' lives, as is habitually checking NBA box scores. Riding the wave of their breakthrough hit "Feel It Still," the group stopped by Bleacher Report's New York offices to talk Portland, how global warming will impact basketball and the best town in France to find Blazers gear. Bleacher Report: So you guys are big Blazers fans? Zach Carothers (bassist): You have to be, man—we're from Alaska, and so we never had our own pro team in the city that we lived in, so we were, like, Mariners/Seahawks fans. Eric Howk (guitarist): He says that, but I mean, I was a huge Sonics fan because those games were always on the AM radio that would go far out in the [Matanuska-Susitna] Valley. We lived in a pretty isolated area. The golden age of like [Shawn] Kemp and [Gary] Payton, Detlef Schrempf, guys like that. Zach: I was more into hockey and never really got into basketball until we moved to Portland. One of our old members was just a crazy Blazers fan, and when they made the playoffs, he was like "Come watch a game!" And it was like, "Oh s--t." Instantly I was into it. It was so much fun. John Gourley (lead singer/guitarist): That was one of my favorite times, because it was like before we had smartphones in the van. So we'd listen to the Blazers games on AM radio. Zach: The community in Portland is just so awesome. I remember being in some terrible bar with a really low tiled ceiling when Brandon Roy made that last-minute, game-winning shot. People started jumping up and down; beer was going everywhere. Those ceiling tiles were all knocked out. The place was electric. B/R: How are you feeling about the team this season? Eric: There's not a lot of help, not a lot of depth. There's no star power really outside of Lillard. CJ [McCollum] doesn't count. Zach: I feel like it's the same as every year. It doesn't matter how they do, we're gonna love it anyway. Everybody still goes to games. Eric: You just don't want to get stuck in that Memphis Grizzlies spot of sort of being a 50-win team for five or six years in a row, because then you never get to rebuild, you don't attract talent. I'm a little worried that we're in that phase right now. We're either too good or not good enough. Zach: In the end, the Blazers will be amazing because the Northwest is the only place that's going to have water. 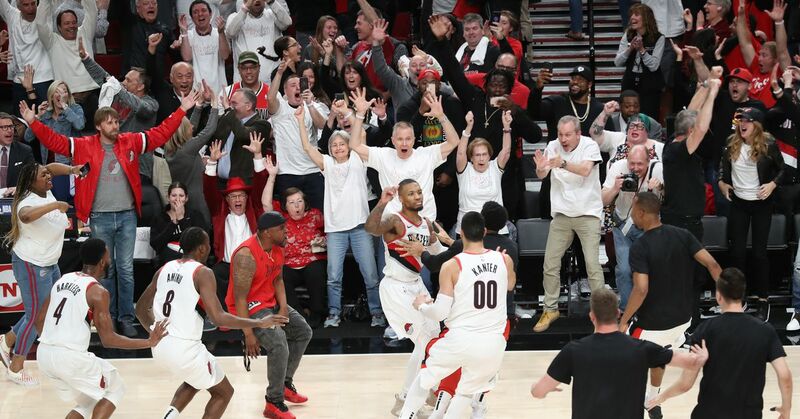 In 50 years, the Portland Trail Blazers will be world champs. Zach: I'm really thinking ahead here. Seattle, Vancouver and Portland will just be one giant metropolis, and that team is gonna rule. Eric: GPQ—Gallons Per Quarter. Gonna be an important new metric. B/R: Do you do a pretty good job of keeping up with the team on the road? Or is it challenging given the travel? Eric: I'm playing fantasy for the first time in a while right now—I've got like a big-money fantasy league going on with some friends. Like $500 buy-in. I've got a pretty good team, though: Lillard, Karl Anthony-Towns, Paul George. Then some secret weapons that I'm not going to talk about on the record. B/R: Who else is in the fantasy league? Anyone people would know? Eric: No, I don't think so. John: We're not in the John Legend fantasy league. I remember a few years ago hearing about how John Legend got kicked out of his fantasy league because he didn't show up for one of the meetings. My buddy was like, "I can't believe I have to kick John Legend out; I gotta call him up." B/R: What was it like to have your music in a Nike ad after living in Portland? John: It's kind of funny, because we've done Nike and Adidas, which [pause] normally isn't allowed. Maybe I shouldn't even say that. John: It's just part of the culture in Portland—we have both Nike and Adidas, and it's so much a part of our circle of friends and our everyday life. Like I ran Hood to Coast [a 198-mile relay] with Kevin Hart and Theo Rossi and the Dimension Six team. It's just a part of the city. B/R: What do you guys think is the biggest difference between Nike and Adidas? John: Nike is obviously more sporty than Adidas. I always associate Adidas with Beastie Boys and Run-DMC. Eric: It's like a Ferrari to Lamborghini kind of thing, a little bit. Ferrari has the F1 heritage—that's Jordans. That's lean, competitive, as practical as you can make it. Lamborghini is flair. John: I love Nike just because it's kind of the opposite of what bands do. I just love the difference. I love running and good running shoes. But then when we fly to L.A., we're always on the same flight as [Adidas vice president] Jon Wexler. I think he's doing really, really smart things with Adidas. They've been really on top of their s--t, and that's all a credit to him. Zach: I grew up with Adidas just because I grew up skateboarding. Now Nike has rad skate stuff, but back in the day, I just bought probably 30 pairs of Stan Smiths—just burn a hole through them in a week because I would skate all day in the summer, which was only like three days. The rest of the time it was cold and snowy everywhere. John: When we could find pavement. B/R: Any shoes from Portugal? Eric: We had Rancourt & Co make us some Portugal. The Man/Lords of Portland shoes. From the other Portland [in Maine]. B/R: When are you guys going to collaborate with noted MC [and Blazers point guard] Dame Lillard? Zach: He won't call me back—I like anything Lillard does. Eric: Everything about him is kind of cool. He's like a throwback. There are so many athletes that just don't really have that social media presence or don't know how to be on camera, and he's just—he's got a Kanye thing. John: He's super inspirational. I really like following [his music]. There are some athletes who I feel like are just looking for likes, and then there are people who are just real. Lillard is as real as it gets. B/R: Are there any sneaker shops that you've come across in your travels that you really liked? Zach: This one time, we were in Lille, France. We came across this tiny little sneaker shop when we were just out cruising around. He had this display case full of Nikes, but you're not allowed to sell Nikes in France without a really expensive license—he was just a big fan. It was just kind of small and real dirty, but he had a hat that just said "F--k Y'all" in the Blazer font. I was like, "Is that the Blazer font?" and he was like, "Yeah, the Portland Trail Blazers, they're my favorite team!" I showed him my Lords of Portland jacket, and we hugged and it was cool. I bought all the remaining "F--k Y'all" stuff. John: Kind of. You know it's weird—I feel like Portland is one of those cities where the indie rock kids all follow the Blazers and are into that kind of thing. Chicago is the other city where you see a lot of that. Some New York bands you'll see rocking Ones or Dunks and things like that, but it is weird that the sneakerhead thing has become so massive. Personally I think it's really silly. Everybody's just paying too much for shoes, hiring people and bots to buy shoes for them when they drop. I think if you're a fan of sneakers, you're a fan of sneakers. John: Hundreds? Lots. I don't even know. It's a weird thing for me because we travel so much, and I'll always try to bring whatever shoes I'm wearing at the time. I'll have like a suitcase full of shoes that I barely get to wear. I'm the a--hole that rocks Nike HTM’s [Hiroshi, Tinker and Mark] on a hike. Everyone's like, "What are you doing, those are $2,000 shoes!" I've never been the type of person that puts things on a shelf or like needs to clean my sneakers every day. I just wear what I like. B/R: Do you have a go-to shoe for the road that you always make sure to bring with you? Eric: I love these Flyknits. They're perfect. They're light, they're machine-washable, which on tour is incredible. John: The practicality of the Flyknit Racer—I mean that's what we all bring for festivals. If it rains, that's what you need. Something that you can just throw in the wash. It just packs so well, is so light. I see people walking around backstage in these crazy shoes and they're just going to get dusty and dirty and muddy. Zach: If we end up at a swimming hole, you can just jump right in. Flyknits can kind of do everything. John: Also as far as tour staples, Common Projects is a big one. Mine are beat up, and people flip out...they're like, "I've never seen them looking like that!" Zach: I just gave you a pair with spray paint on them. We had to spray-paint our cases, and on the second day of wearing a new pair of Common Projects, I dripped spray paint on them. Like, g-ddammit. John: Flavio [Girolami], the designer, he made a great shoe. It's expensive, but I still have the first pair that I bought five years ago. I've worn them on every tour we've done, I wear them in Alaska, I wear them in our video for "Noise Pollution"—running around kicking down windshields, doing all that stuff. It stays together. Zach: We live harder lives than most people. We can't have nice things. Eric: It's hard on everything—our gear, luggage. Zach: Our backs, our bodies, our livers. B/R: This is getting grim. John: We're strong as f--k.
Zach: We're the strongest men on earth. But our brains are pretty wet.